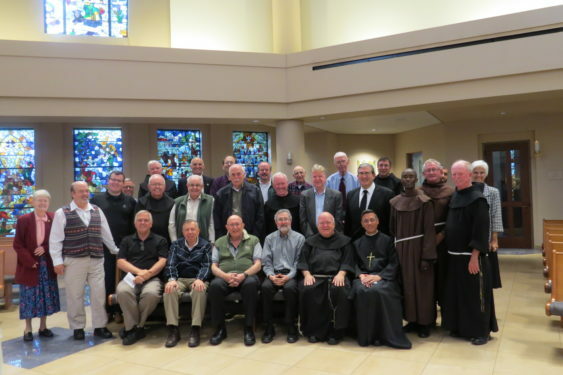 Religious brothers from various communities recently gathered for an afternoon of reflection on their mission and ministry in the world today. 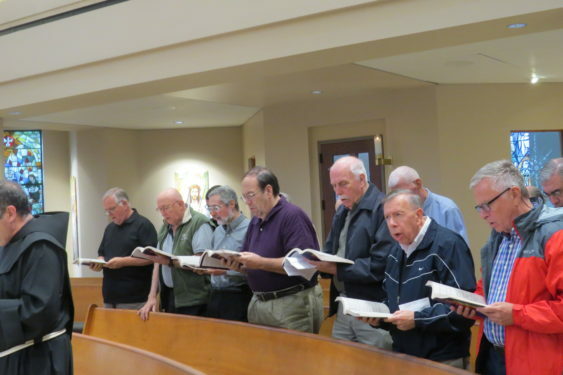 Nearly 30 religious brothers from the dioceses of Brooklyn and Rockville Centre took a break from their varied ministries recently for an afternoon of reflection at St. John’s University, Jamaica. Gathered inside St. Thomas More Church, the men spent time in prayer, attended a talk and shared some personal stories. Two Franciscan Brothers visiting from Ireland also took part in the day. Brother Peter O’Loughlin, C.F.C., an Edmund Rice Christian Brother, was the keynote speaker for the event. Brother Peter served in education for many years and is currently a member of his elected leadership team. In his talk, he addressed the Vatican document, “Identity and Mission of the Religious Brother in the Church” from a pastoral and personal vantage point. He reminded the brothers that by virtue of their baptism and their religious vows, they are called to be a prophetic witness in the Church and world today. “Just a Brother: an uncomplicated witness,” Brother Peter said, is the chief role of the religious brother by being a living witness to the covenant and commitment to the original call of their founders who radically responded to all the needs around them. All apostolic religious life is rooted among the people of God. This brings its own challenges in the ways all religious communities fulfill the call of their charisms and mission. Brother Peter then challenged the men to look beyond their ‘first ministry,’ which for many is education, and to ask how they continue to respond to the needs of this time; how they live brotherhood as service. Several brothers responded with their personal reflections on what being a brother today means and how they are challenged to witness in that capacity, whether still in active ministry or not. Sister Maryann is the episcopal delegate for religious in the Brooklyn Diocese.